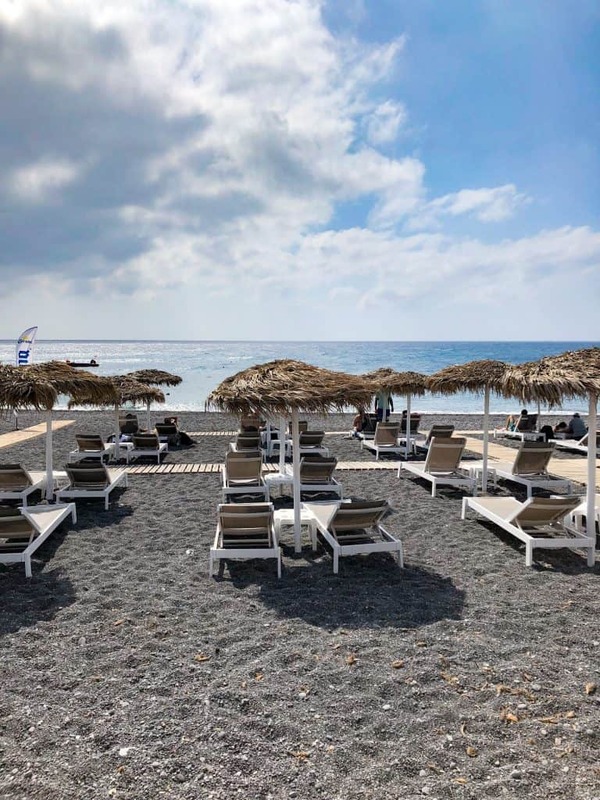 Santorini Greece Island Holiday Vacation Travel Guide: Things To Do and Where to Stay includes a full list of deals and an itinerary of things to do and sights to see with video. 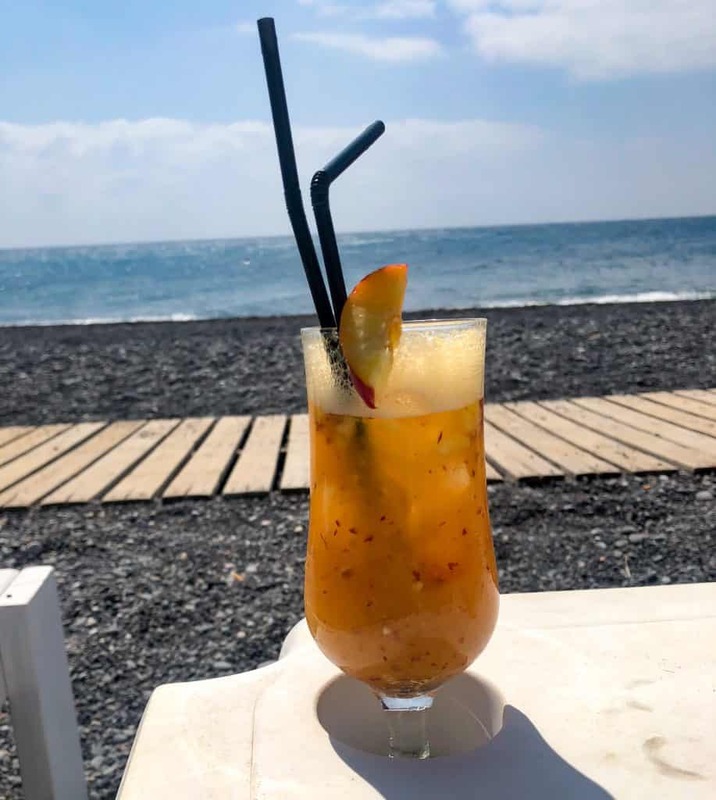 It includes recommendations for the best hotels, tours, blue dome churches, restaurants, and which beaches to visit, including Kamari Beach. 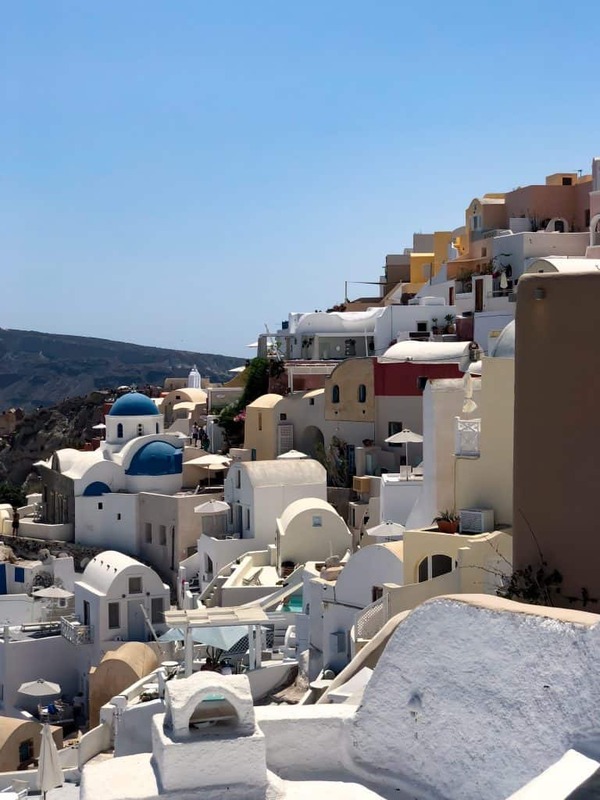 This guide also includes brief history of Santorini. 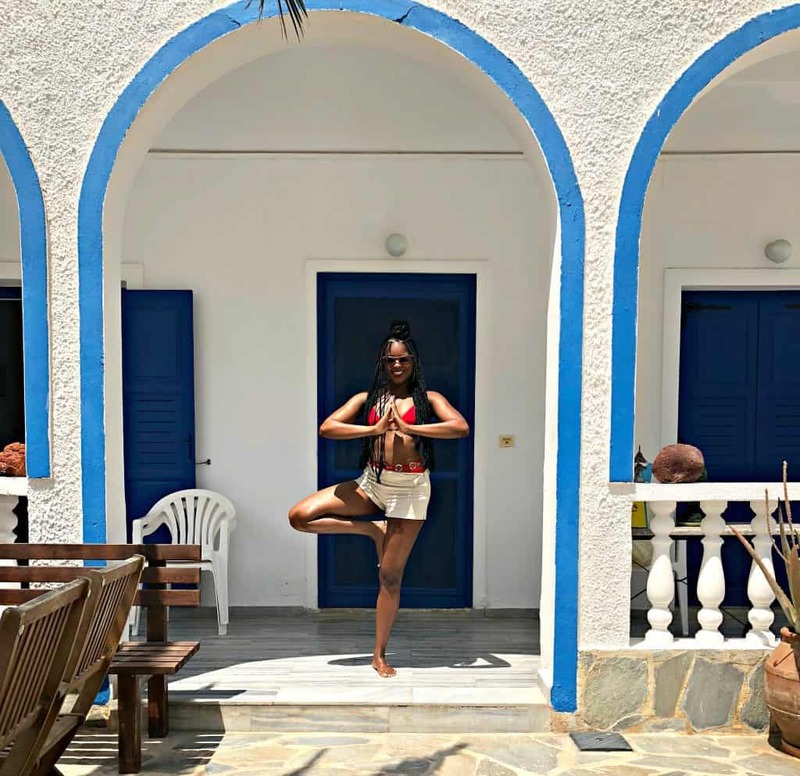 Be sure to check out my post How to Plan for a Trip to Greece for booking and packing tips. 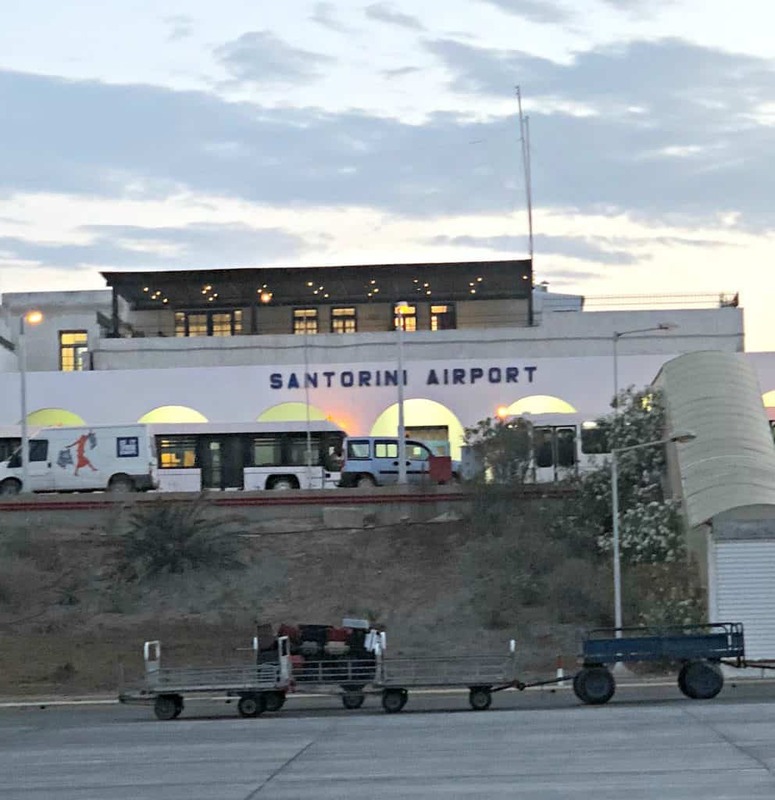 Our third stop during our Greece vacation was to Santorini. I could not wait for this part of the trip! I figured it would be my favorite part of the trip and this held to be true. Santorini is GORGEOUS. No video or photo can capture how truly gorgeous this island is. Santorini sits in the Aegean Sea and has classically been referred to as Thera or Thira. (I saw these names pop up a lot in random areas.) The island was formed as result of a volcanic eruption. History and myths state that the most devasting eruption, the Minoan eruption, occurred around 1613 BC. It was one of the largest, known eruptions to ever surface on Earth. The eruption devastated Thera and formed a group of islands. The volcano lies in the sea and is dormant, but active. Because of this, the beaches are made of volcanic pebbles and sand. I have never seen anything like it. It is so cool to look at. It is far from your “sandy white beach.” So that is something you should definitely keep in mind. 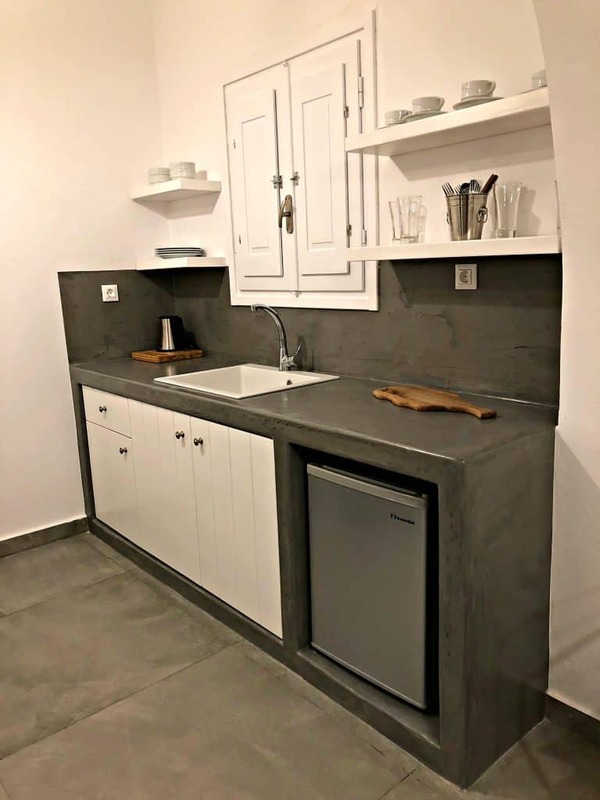 Where you choose to stay in Santorini will heavily depend on your overall goal for the trip. I feel like you have two options, near the beach or in the capital Fiera. 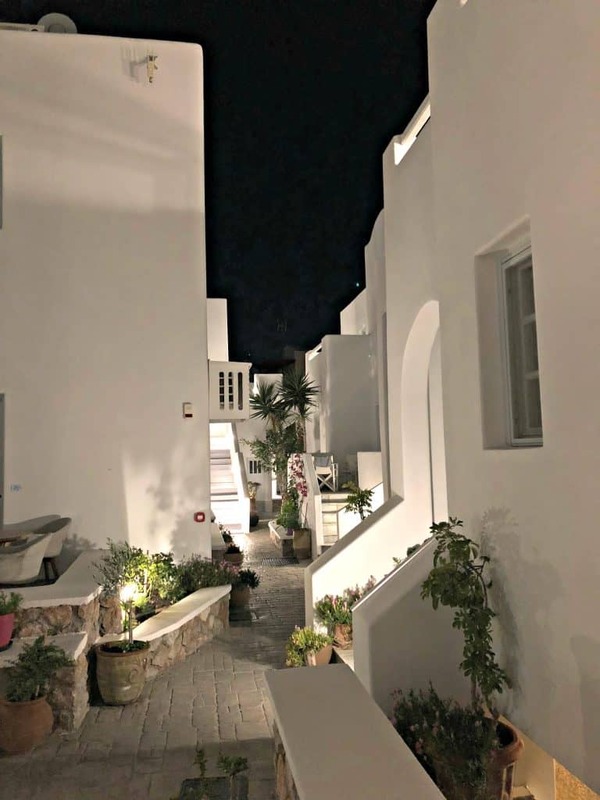 I love to stay in Airbnbs when I travel, but I struggled to find an Airbnb in Santorini. This could be because Santorini is super touristy or it could have been because we wanted to be near the beach. I feel like it’s because of the overwhelming amount of tourism. When I put in Santorini as the location, often a nearby island location would show up with availability. I changed my search to hotels. I wanted to stay near the beach so we stayed in Kamari. Kamari is north of the airport. 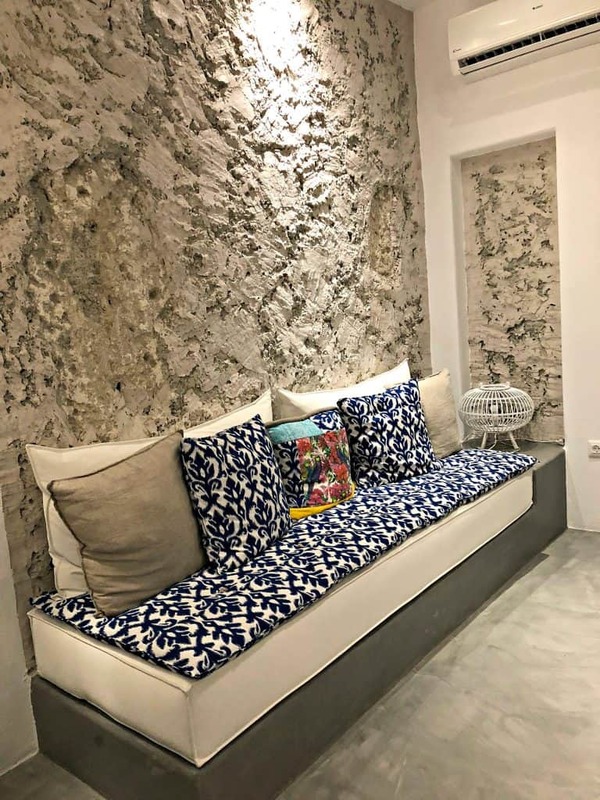 We stayed at the Makris Apartment Hotel Santorini.I absolutely loved our stay here. We booked our reservation through Travelocity. Our hotel was a one-bedroom apartment with a kitchen and 3 beds. I loved both the interior and exterior. The apartment was beach front and offered free breakfast. The breakfast was very continental. It included boiled eggs, toast, English muffins, bacon, fruit, Greek yogurt, coffee, and juices. The WI-FI in our hotel room was ok in terms of speed. It was much faster in the restaurant that served breakfast. Throughout our entire stay in Greece, I noticed the speed was always faster at restaurants vs where we were staying. Kamari Beach is gorgeous! The black sand is actually pebbles/small rocks. Keep this in mind! You’re probably not going to go running barefoot on this beach. Combine this, with how hot the black sand will get with the sun. You will probably wear your flip flops from your beach chair to the shoreline and then ditch them. This is what we did! And it makes so much sense. Beach area directly in front of our hotel. I enjoyed myself. We would wake up early each day just to lay on the beach. As with typical beaches alongside hotels and resorts, there were a few different people walking along the beach trying to sell products and services. One was an on-beach massage. I have done this in the Bahamas and I am not opposed! There was a local Thai spa and massage location very nearby. I suspect a few of their workers roam the beach for additional service. If you chose to get one, HAGGLE. We ended up paying 25-30 euro for a full body massage that was originally offered at 65 euro. During our visit, Red Beach was closed due to landslides and rockfalls (YIKES). 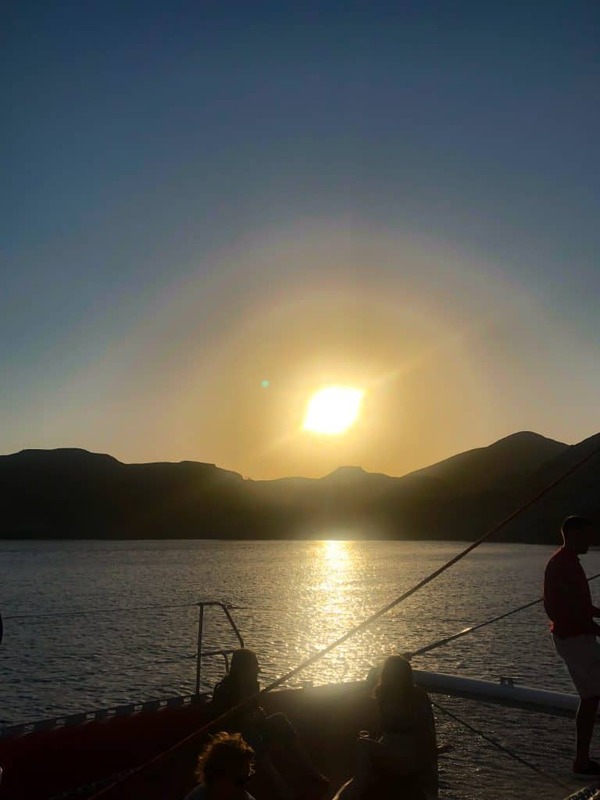 We got to see great views of it during our catamaran ride (see details below). The beach is gorgeous! It is red, just like the name. 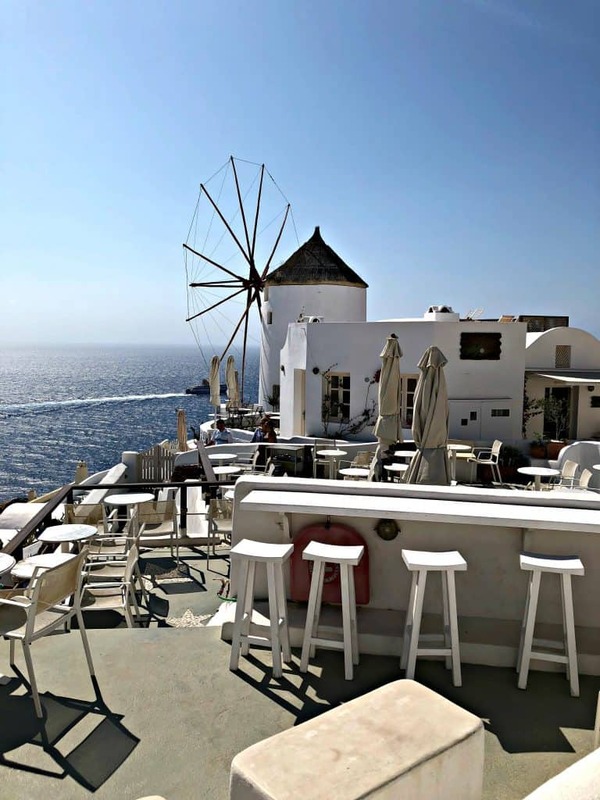 It is on the southern part of Santorini and 12 kilometers from Fira, the capital. You can get there by taking a bus from Fira (when it’s open). Bus rides are typically 1.75 euro. I didn’t visit Perissa, but I have read it is very similar to Kamari. 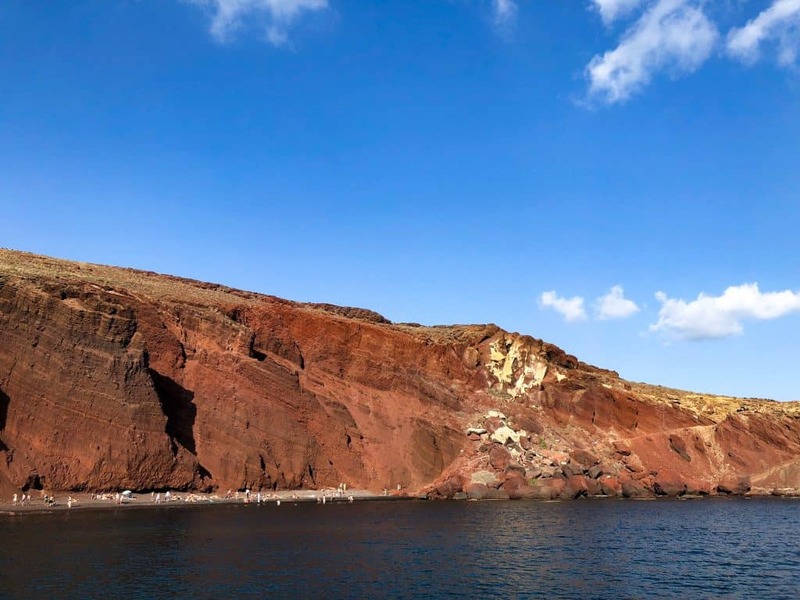 Fira is on the west side of the island and is located on caldera cliffs that are opposite of the volcano. A caldera is a large cauldron that forms by a major eruption that leads to the collapse of the mouth of the volcano. If you have seen a bunch of pictures of cliffs in Santorini, this is probably what you have seen. 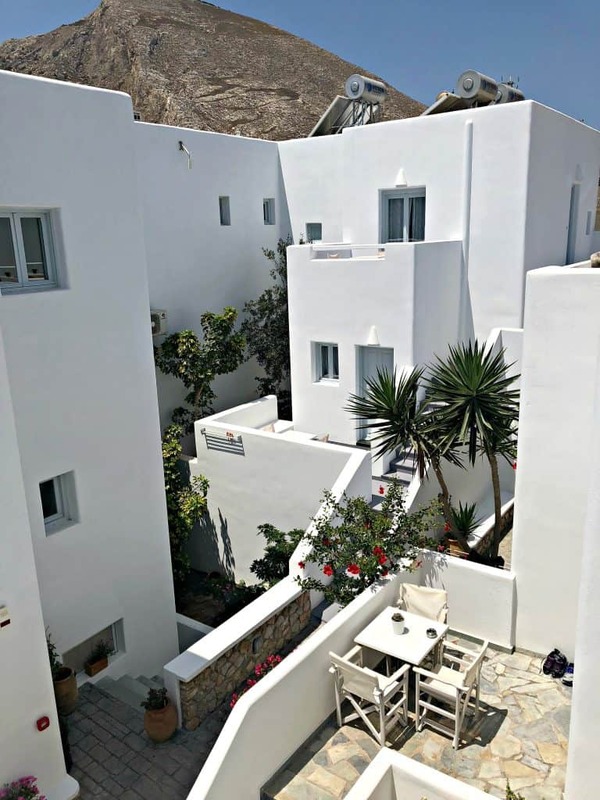 If you stay in Fira you have the option to book a location with breathtaking views of the caldera. A lot of hotels and apartment hotels had a pool. So if you are ok with hanging out by a pool with breathtaking views, instead of staying beachfront, this may be the best option for you. It’s pronounced ee-yuh. 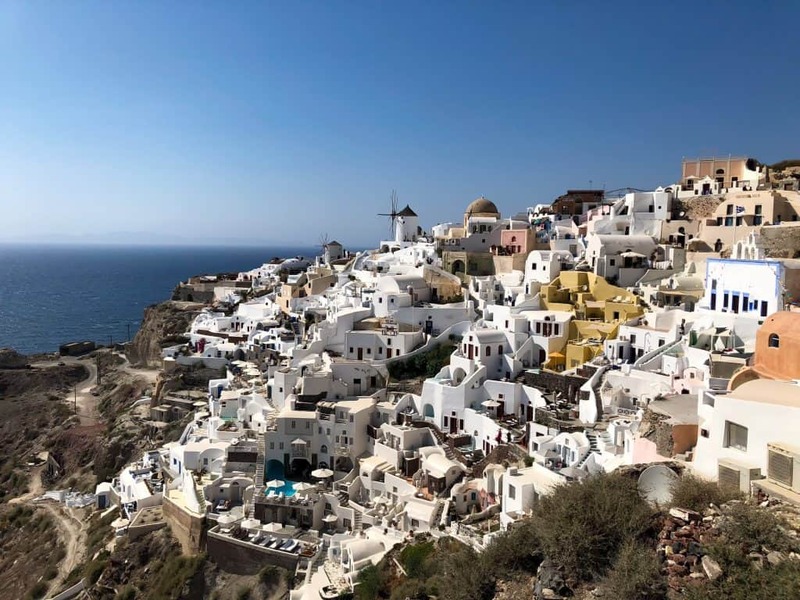 If you have seen photos from Santorini they probably came from Oia. The village is situated on top of a cliff that has the most INCREDIBLE views I have ever seen. EVER in life. Oia is 11 km from Fira. view of the Santorini caldera, taken from Oia. 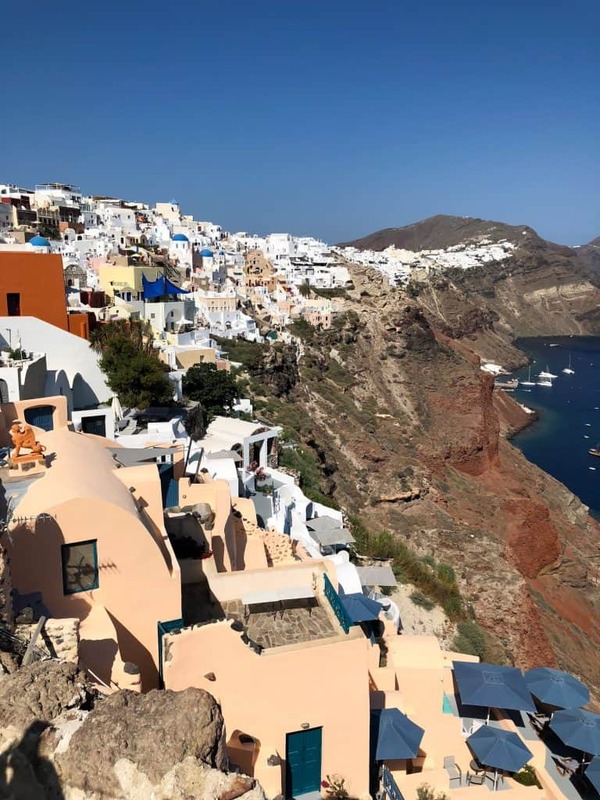 If you stay in Oia you may have a pretty interesting walk/hike to your living quarters. During our site seeing of the area, we noticed a lot of tourists trucking their luggage up and down the narrow cobblestone streets. This is a HUGE tourist area and filled with crowds. This can be difficult. I would place this on your MUST DO IN SANTORINI list. This is where you will find a lot of the scenery from postcards. This is also where you will find those infamous blue domed churches. There are also amazing views of the cauldron here as well. We took the bus from Kamari to Fira, switched buses and hopped another to Oia. The process took about an hour (from Kamari to Oia) each way, there and back. The sunsets are breathtaking from Oia. You can hop into a coffee shop and enjoy the most incredible view. There are tons of signs at the entrance that point to the paths that lead to the sunset. You can follow this same path to get to the best areas for photos. We dipped into the Lotza Restaurant for a lunch. It’s located atop a hill from the blue top churches. The view is incredible. The food was good, but not the best that I have had in Greece. 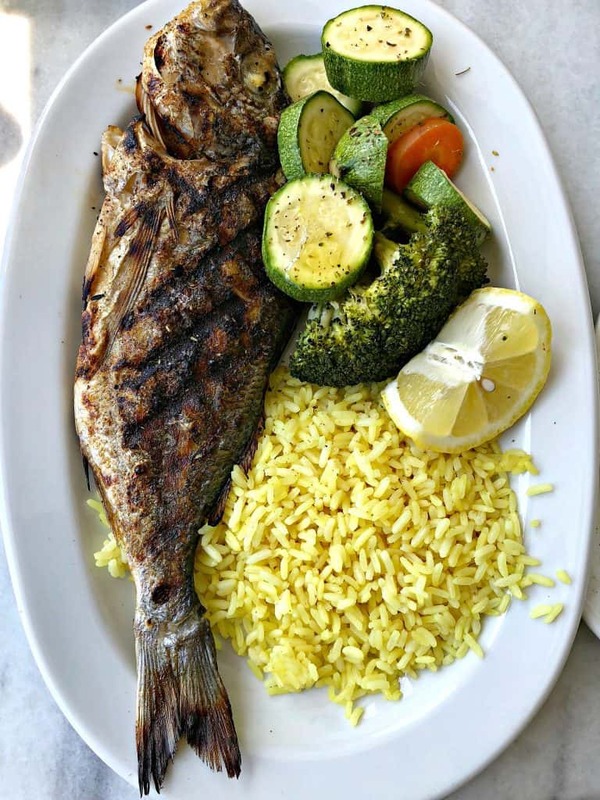 I ordered the fresh sea bream (it’s caught locally each day), served with rice and vegetables. 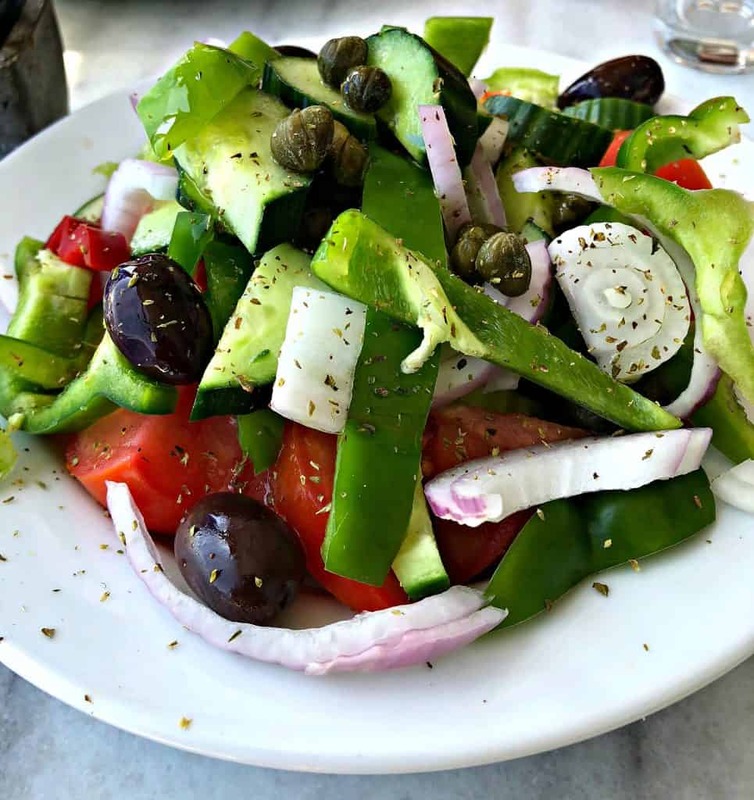 We also ordered a Greek salad. This one included green bell peppers, which I have seen a couple of times during our stay, but it wasn’t commonly prepared this way at other spots. On our walk back to the bus stop, we stopped at Yummy n Sunny for smoothies. 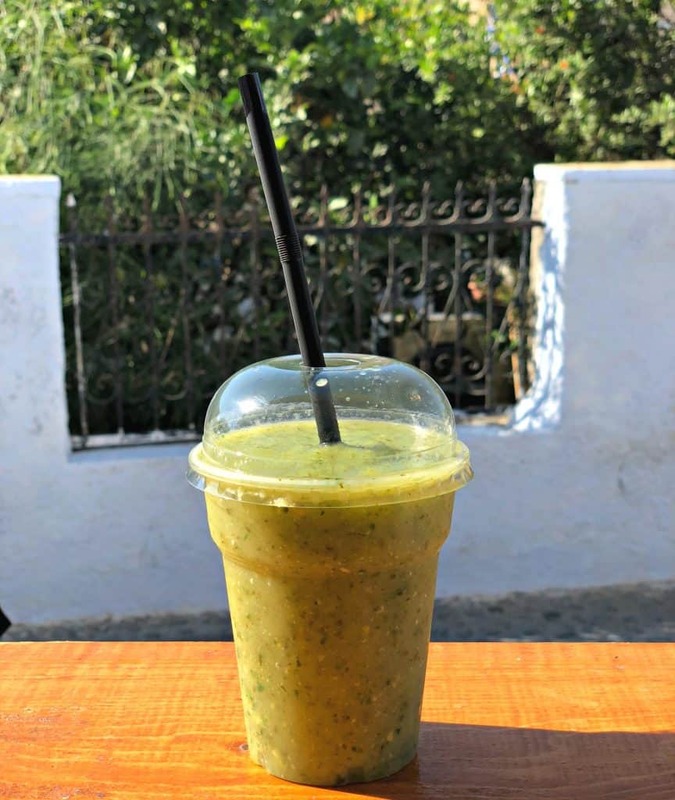 Great real fruit and veggies smoothies, and great WIFI speeds! I ordered a smoothie with kale, mango, apple, and ginger. It was delish! This was my FAVORITE part of the trip. I love to go out on boat tours when I vacation. 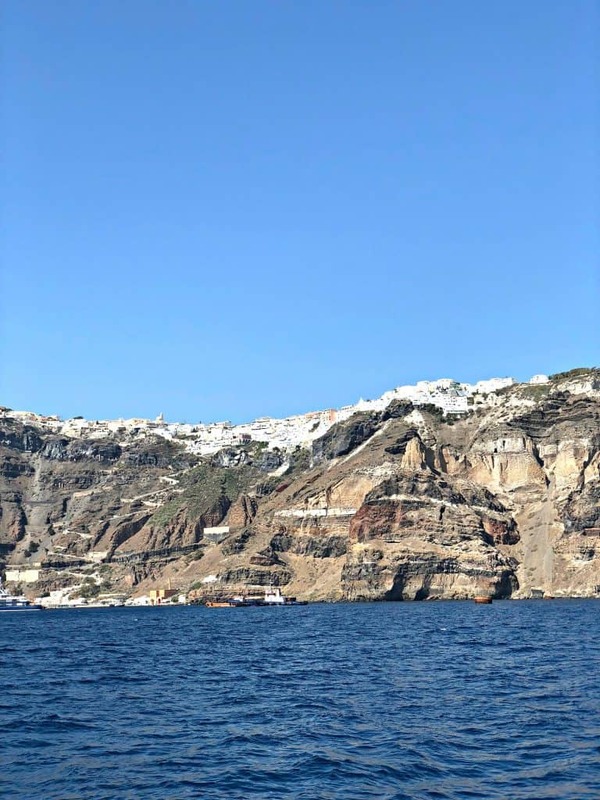 A boat tour is specifically necessary for Santorini because you can see all of the incredible views the island provides. We booked the Dream Catcher tour with Santorini Catamarans. I can’t say enough nice things about this tour. It has a fully equipped galley and bar. They provide a full grilled meal and unlimited beer and wine. The meal included grilled chicken, grilled pork, bread with olive paste, grilled potatoes, Greek salad, pasta, and fresh tzatziki. This meal was INCREDIBLE. 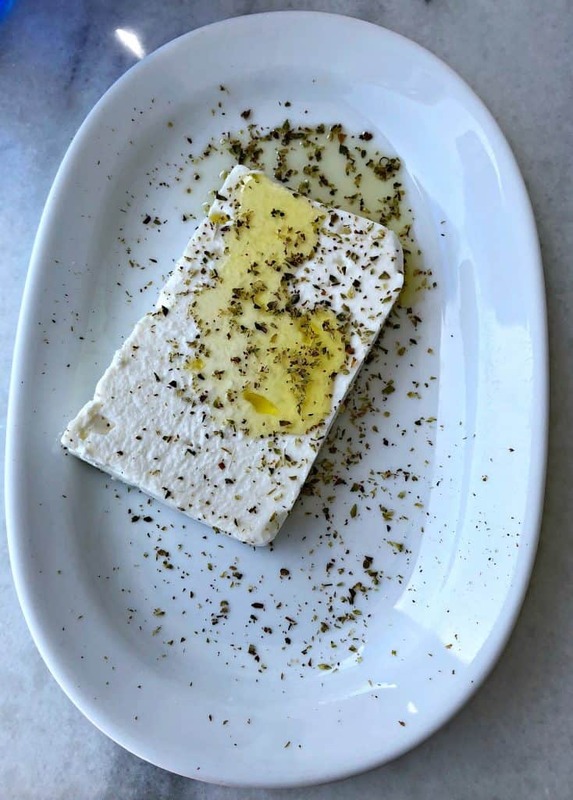 Hands down, the best food I had during my visit to Santorini. The food was so good I didn’t have an opportunity to capture a photo! The deck is very open and spacious. The seats on board were super comfortable, the most comfortable I have experienced with other tours in other countries. There are sunbathing nets that are also comfortable. If you are afraid of water (you probably wouldn’t be out on a boat, but if you are), this area may not be for you. You can definitely feel the current. Their team was amazing! Our captain was super funny and did a great job providing us details about the history of Santorini. 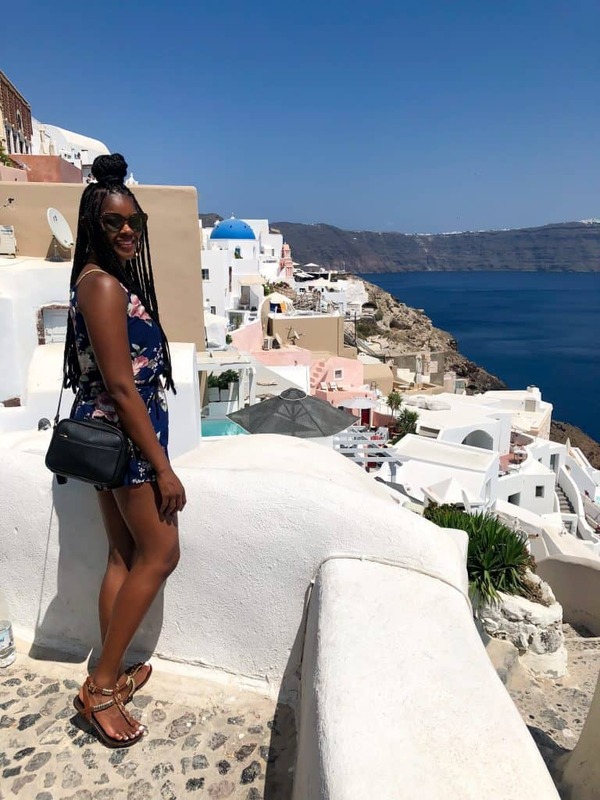 I would love to go back to Santorini and book this tour again. Now the sunset. The SUNSET. I love to choose a vacation spot that is surrounded by a large body of water because I find it to be so calming and peaceful. I stared into the sunset surrounded by this gorgeous, blue water feeling incredibly blessed. I also told my friends this is why I work so hard so that I can take trips like this one frequently. The sunset was so magical. Bring a long sleeve shirt or jacket with you. When the sun begins to set the temperature will drop a lot. I was grateful the crew had blankets on the boat to provide. I would like to say this is on my bucket list, but it is NOT. I am far too afraid, and my swimming skills are pretty much level 3. If you are into this, do it! The view is amazing and there are a ton of cliffs. For nightlife, we pretty much just hit up the lounges near our apartment on Kamari Beach. This included Galaxy Bar and Mango. Both were located within walking distance of our apartment. If you are looking for “real nightlife” I recommend Fira. We heard a lot of talk during our boat tour about Two Brothers Bar, Enigma, and Koo Club. We didn’t get a chance to do this on our trip, but photos here are amazing. If you have the time, plan a trip! 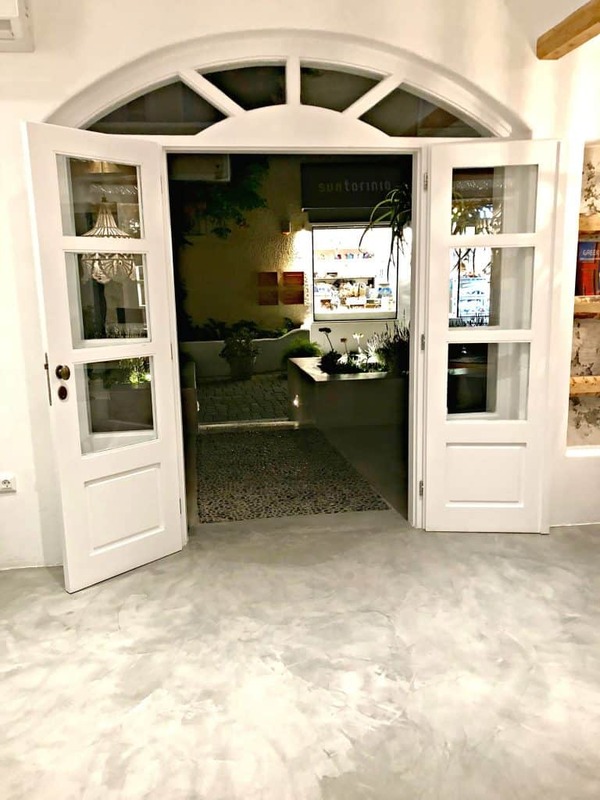 Thank you, Santorini! You are truly missed. 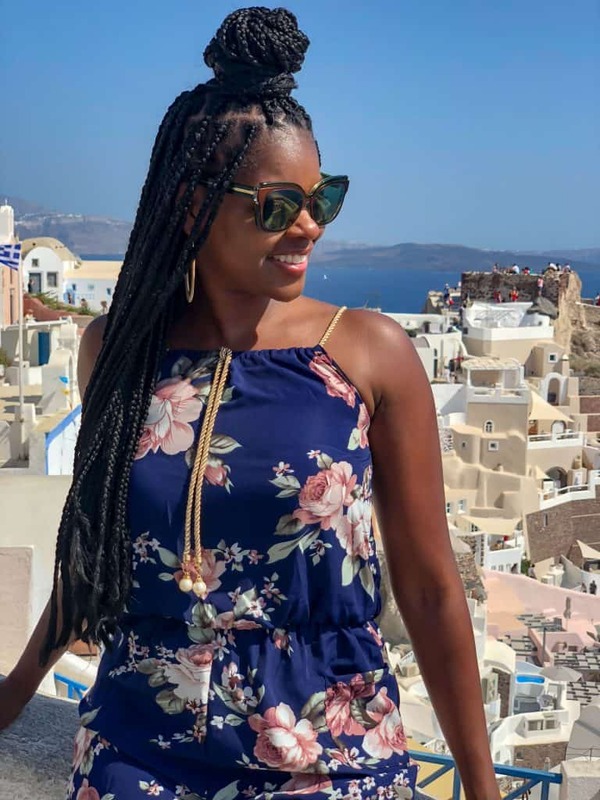 I love Santorini and totally agree that no photos can show how gorgeous it really is. It’s such a special place, and your post makes me want to go back since we didn’t get to spend very much time there during our last visit. It is so beautiful. Santorini looks absolutely gorgeous! I would love to visit Greece one day. It looks like you had an amazing trip. I would love to have a vacation in Santorini. Your photos are so beautiful! Greece looks amazing! It’s always been a vacation I’ve wanted to take! I love the building designs of greece! It is so pretty. The sand looks awesome with your white toe polish and that’s sad that the red beach is being destroyed. I love your tree pose at the end! So so so beautiful. 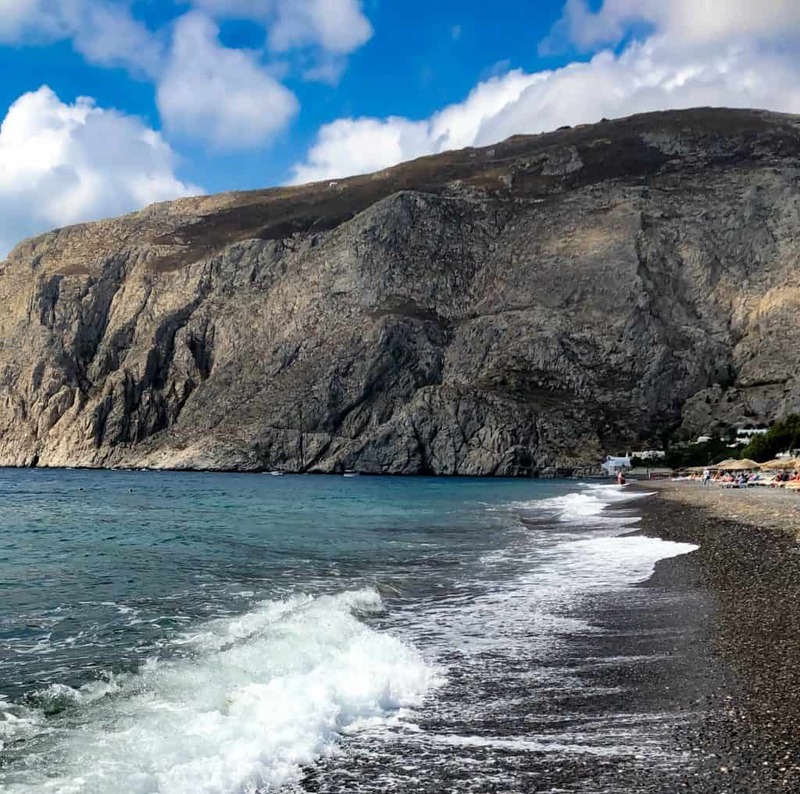 My husband and I have a dream of going to Greece when we retire…..many ,any years from now. One of the most famous and visited islands in my country! 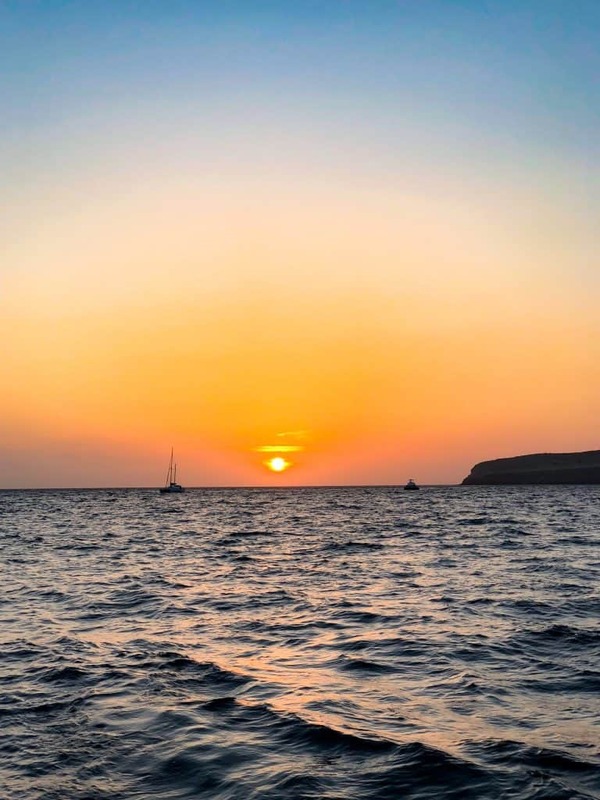 I love your beautiful photos, you have captured the beauty of this island! Believe it or not I live in greece and never been to santorini. I’m not the island kind of person but santorini looks so gorgeous I need to reconsider! The food looks so good as well! 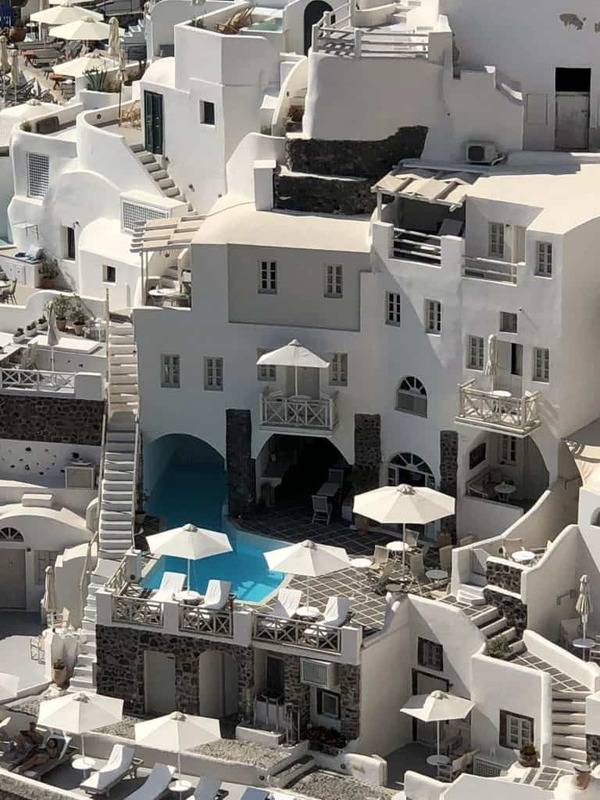 Santorini seems like the place to visit. To me, the pictures were able to capture the beauty of the place, thanks for sharing. Aaaah!!! 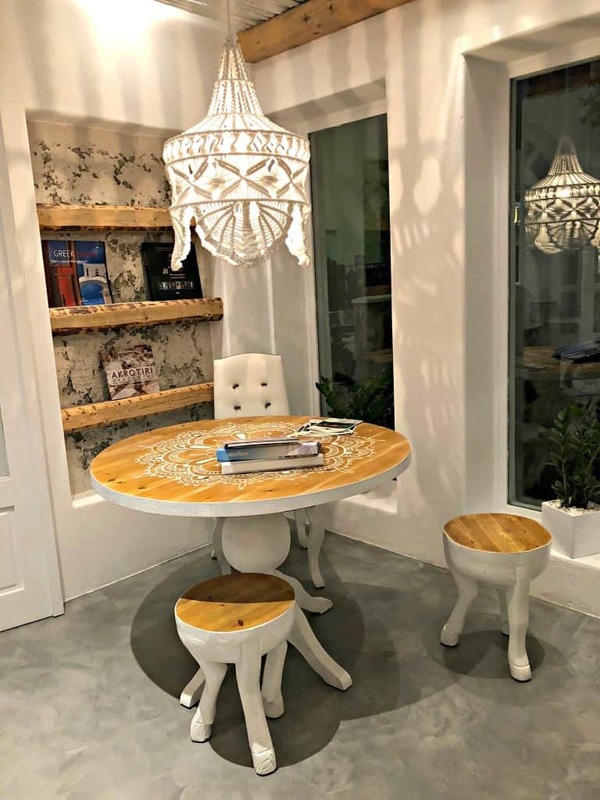 Love, love your photos! Makes me want to go ther. I bet that would be such a fun trip! I really wish we could afford to travel.